Each Thursday, Freddie Mac publishes a “national” mortgage rate in its Primary Mortgage Market Survey. Despite its flawed methodology, the survey does a good job of showing whether mortgage rates are rising or falling. Since early-April, rates are down. And down big. Going back 23 weeks, week after week, the story is the same. Mortgage rates are falling, cutting new, all-time lows. You can’t watch the news without hearing about it. As for why it’s happening, the reasons are basic. When either (1) the economy hits a rough patch, or (2) when Wall Street uncertainty rides high, investors prefer to put their money into “safe” instruments versus risk and bonds backed by the U.S. government fit the bill. The U.S. government has never defaulted on debt and its backing is considered a guarantee of repayment. Ergo, U.S. government-backed debt is “riskless”. When investors move into government debt, it’s often called a “flight to quality”. Mortgage bonds gain on it. This is because mortgage-backed bonds have the implicit backing of the U.S. government and are considered “safe”. The added demand leads bonds prices higher and, because bond yields move opposite of price, mortgage rates lower. On April 8, 2010, the average, 30-year fixed mortgage rate was 5.21% — the highest point for 2010. Since then, however, fears of a renewed recession and general economic malaise have contributed to an ongoing, seemingly-endless rally. There’s been very little “good news” to reverse the slide, the constant negativity helped to lower mortgage rates by almost an entire percentage point. Not since ever have conforming 30-year fixed mortgage rates been this low in Cincinnati. Today’s low rates have reduced homeownership costs. Let’s look at the interest paid over the life of a loan, plus its upfront costs (i.e. “points”). The lower the interest rate, the less expensive the loan’s long-term cost. That’s a three-hundred-sixty-thousand dollar difference in just 16 years. And, 1994 isn’t that long ago, either. There’s plenty of people in Cincinnati who’ve lived in their same home for 16 years. If these same people bought a home today — at today‘s rates — the cost of homeownership would be 41% less. 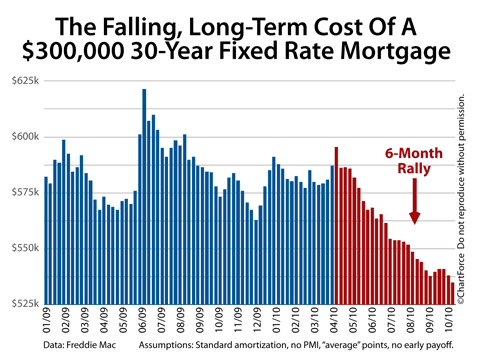 Furthermore, as compared to May 1, 2010 — the day after the $8,000 federal home buyer tax credit expired — the cost of carrying a 30-year fixed rate mortgage to term is lower by $51,000. Mortgage Rates Are Low. Lock In Already. When we talk about home affordability, it’s stuff like this; long-term mortgage costs are down; home values are troughed; lumber and labor are cheap. It’s an excellent time to buy or build a home, all things relative. It’s also an excellent time to refinance. If you bought a home between 2006 and the early-2010, you should really look at rates vis-a-vis your loan term costs of ownership. Not every family will save 41% long-term on their mortgage, but some of you will. Mortgage rates change all the time so that low, 30-year fixed rate might not be available for you if you wait. Therefore, if it makes financial sense to refinance today, do it.